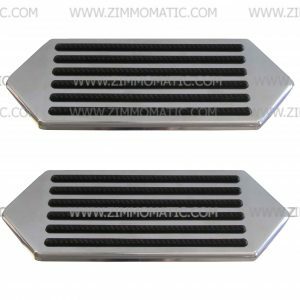 Our custom decorative step treads are decidedly the best option on the market. Over the next few months of 2017, we will be introducing several all-new designs. With the bars style being the first, we are happy to see that the trucking industry is embracing this wonderful new design. Hidden fasteners secure the step tread to your stainless steel battery box cover, deckplate, or any other surface where a foot pad is necessary. A rubber O-ring seals the edges of the step tread to keep water and dirt from working their way underneath. The rubber insert affords much more grip to wet boots than any of the current billet aluminum steps. Typical treads are also taped on with double-stick tape; however, ours, with hidden fasteners, are much safer as well as theft-resistant.